Man has dreamt of flight ever since our ancestors first saw birds soaring into the sky. And even after the dream was realised, first with hot-air balloons and later with heavier-than-air aeroplanes, the dream remained unfulfilled. Because being truly at one with the air, able to swoop and soar like a falcon or an albatross, remained an impossibility. And in legends where the dream became real, as in the myth of the Ancient Greek birdman Icarus, the price was a heavy one; an ignominious crashing to Earth. But for one brave Swiss pioneer, a former military pilot called Yves Rossy, the dream has become reality. For as these amazing pictures show, Rossy, 45, has managed to come as close as it is possible to get to the feeling of being truly like a bird. Back in 2003 Rossy, now a commercial airliner captain, began his Flying Man project, when he strapped a pair of stubby wings to his back and leapt out of a plane, swooping eight miles in freefall for the loss of just 1000ft in altitude. Strapping on the contraption, which is made of various metals, fibreglass, Kevlar and carbon fibre, Rossy climbs into the small aircraft which is to launch him into his flight. At an altitude of some 7750ft, he leaps out, just like a skydiver. But unlike a skydiver, he does not plummet to the Alps below. There is just enough lift generated by the 10ft aerofoil strapped to his back to negate the effects of gravity. At first, after the wings are unfolded electrically, he becomes a glider then, when the four kerosene-powered engines are turned on, he becomes a jetplane. Thanks to the engines, each of which develops 22kg of thrust, he can not only maintain altitude but actually gain height, he says, at a rate of several hundred feet a minute - until the fuel runs out six minutes later. He lands with a conventional parachute. "There have been no proper aerodynamic studies of how to simulate this sort of flying," he says. "All simulations involve a rigid aircraft. My wings are rigid, but of course I am not." He steers the contraption, he says, 'purely by intuition'. Like a bird, he can adjust his 'trim' with incredible precision with the flick of a foot or by simply leaning his body one way or the other. "It is like how a child would fly," he says. He says his ultimate goal is to take off and land just using his Jetwing without an aircraft to take him into the air. Now he has gone one better, strapping four, small kerosene-fuelled turbojet engines (mini-versions of the engines used to power airliners designed to power model aircraft) to his wings to create what is effectively the first rocket-propelled hang-glider: the ultimate microlight, jet-powered flight at its most minimalist. His passion to fly like a bird began at the age of 30 when he began learning how to do free-fall parachute jumping. He has completed 1,200 free-fall jumps. He said: "I had tried sky-surfing, but that didn't last long enough either, so I decided to create my own wings to enable me to fly for longer." Rossy's flights have taken place from the Yverdon airfield in western Switzerland. Last week, after opening the wings, he glided to 7750ft, ignited the engines and waited 30 seconds for them to be able to stabilize and began to open the throttle. At 5000ft, he achieved horizontal flight for more than 4 minutes at 115 mph, faster than the small aircraft which took him into the air. He steers simply by shifting the weight of his body, and lands with the aid of a parachute once the fuel is exhausted. "It was an amazingly good feeling, like in a dream. When you are in an aircraft you have to steer by a stick. You have no contact with the elements," Rossy told the Daily Mail. 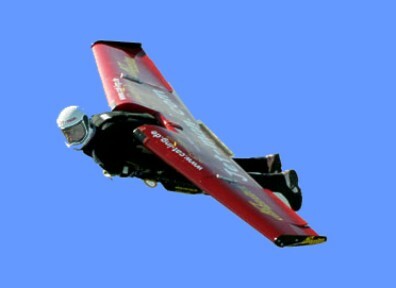 His extraordinary flight can be seen on Rossy’s website, www.jet-man.com. Like the semi-mythical flying jet-backpack (which was actually tested by the US military in the 1960s) Rossy's £150,000 flying machine, which with engines, wings and fuel weighs only 110lbs, sounds like something out of science fiction. "It would be a great device for James Bond so he can go behind enemy lines," he says. "I want to fly, not to steer." "Up there in my invention, I am as free as a bird." See Also: "Rumors About the 'Flying Beings' Have Been Circulating Around The Globe"